There is nothing quite like the smell of freshly-baked bread. However, making it yourself can be a chore. The mixing, kneading and resting can take ages! Even then, there are no guarantees the bread will turn out as well as you’d like. A bread machine means you can have fresh bread whenever you want, without all that hard work. Let’s take a look at what the Panasonic SD-RD250 bread maker has to offer. This appliance is compact and slim, gray and white, measuring 14.6 by 11.1 by 12.8”. It’s economical on space so can be kept on your kitchen countertop or stored in a cupboard or on a shelf after use. The bread maker is simple to use. Just add the ingredients, select your program and the machine does the rest. 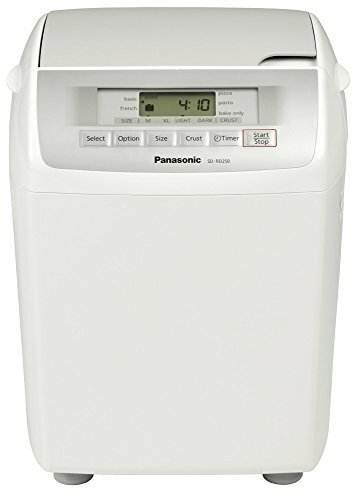 The Panasonic SD-RD250 makes bread in two loaf sizes—the medium size weighing about 1 pound, and the extra-large size weighing about 2 pounds. It will mix, knead and bake. You can also select how crusty you would like your bread to be, from two options: light and dark. The baking modes include basic bread, French bread, pizza dough, pasta dough and more. The basic mode is for various loaf types, including whole wheat and white. The French bread option produces bread with a crispy crust and fluffy, soft center. The pizza dough mode will let you mix perfect dough for homemade pizza in about 45 minutes. If you are a lover of pasta, the machine will mix the dough for you—ready to be rested, shaped and cooked. The ‘bake-only’ option lets you make cakes and tea bread. Operating the machine is a breeze. There is a large, digital LCD display with clearly-marked program buttons. It also has a preset timer. Perfect if you want fresh bread first thing in the morning. There are indicator lights which tell you when your selected baking or dough preparations are complete. A dispenser is built in, with a capacity of just over 5 ounces. This allows you to add nuts or dried fruits to your bread, which will be evenly distributed through the dough. The dispenser is easily removed for cleaning. The inner bread pan and kneading blade have a diamond-fluorine, non-stick coating. This makes the bread, dough, or cake easy to remove, and makes cleaning easy. The lining is durable and scratch-resistant. The pan also has a handle for ease of removal from the machine. This handle can get hot so make sure you protect your hands when touching it. The top-loading design has a lid that locks in place. The machine has a one-year limited warranty. It comes with accessories, including a measuring cup, measuring spoon and recipe booklet. The simplicity of the settings makes it user-friendly and the five functions are easy to select. It’s unlikely you will choose the wrong one by mistake. The quality of the finished products is spot on, with breads that are perfectly soft in the middle and crusty on the outside. The ‘rapid-bake’ function means a fresh, crusty loaf is ready in under two hours. The unique dispenser for dried fruits and nuts disperses them evenly throughout the loaf so they don’t end up clumped together. The non-stick coating means bread and dough slide out with ease and you don't leave half the loaf in the pan. Washing it up is a cinch as well. As with any appliance, it’s not all perfect. My main complaint is that it’s a little noisy when operating. There are no specific settings for multigrain and whole-wheat bread. Some whole-wheat flours can be used; however, the loaves may not come out full size. There is also no viewing window in order to see the progress of the bread as it’s baking. The Panasonic SD-RD250 bread maker has been a strong seller for over 10 years. It is a simple-to-use workhorse that is loved by many. Baking your own bread lets you control what goes into it. You don’t get the additives and preservatives found in store-bought bread. This makes it a much healthier option. You can decide if you want to add nuts or even seeds for some extra nutritional value. The features of this machine will produce a perfectly-baked loaf, pizza or pasta dough, every time. Older PostWhat Are the Best Meats for Fondue?